Take a trip through the alphabet with funny animals doing funny things! 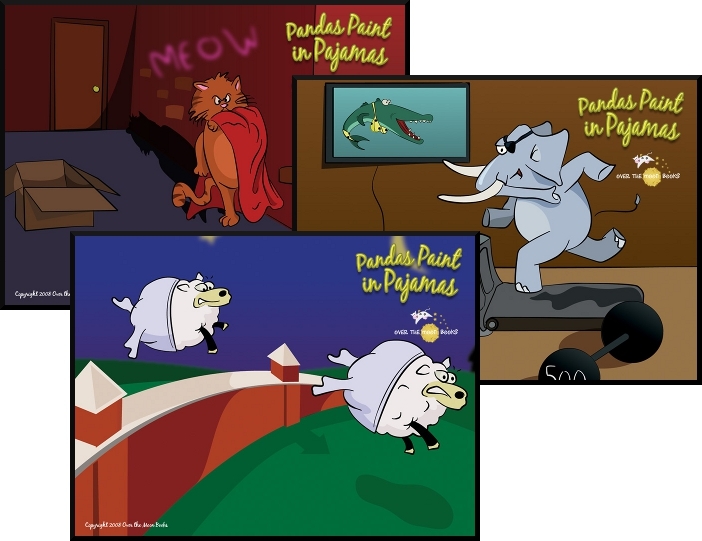 Pandas Paint in Pajamas, written and illustrated by Avery Nubson, is a colorful alphabet book that uses comical illustrations to visualize the short sentence on each page that uses the alphabetic letter being introduced. For example, the sentence for the letter “A” is “Alligators argue in armor.” The illustration on the opposite page has two alligators sporting medieval arms and armor in what appears to be a heated debate. Alphabet books are something of a dime a dozen nowadays. The public libraries and school systems are full of them, and you’d be hard-pressed to not find at least 10 different titles at your local book store. These books are popular and very educational, allowing the reader to introduce the listener to the alphabet. As such, I could end this review right here by stating: “this is just another alphabet book”. Pandas Paint in Pajamas does two things very well that elevate it above the majority of other alphabet books available to you. First, the illustrations are funny. Funny enough where the adults even chuckled whenever they saw them. True, the adults who have read this book and talked to me about it might just be easily amused, but funny is as funny does. The adults laughed, the little geeks laughed, and everyone is happy. When was the last time you read an alphabet book that you had to stop reading because everyone was laughing and not paying attention? Second, not only does the book provide an easy to read sentence that uses the letter of the alphabet currently being introduced, but it also provides a definition and pronunciation guide for each word in that sentence. This allows the reader to help the listener learn more about what is being depicted in the images and described in the sentences. The listener not only walks away with a story using the alphabet, but also gets new words added to their vocabulary. The end result is a delightful book that is fun to look at, easy to read, and educates from the first page to the last. My little geeks very much share my humor in most things as I am pretty sure I am a 36-year-old kid. The Three Stooges crack me up, I love watching Phineas & Ferb, and I think Invader Zim is brilliant. Since I looked at Pandas Paint in Pajamas and laughed out loud at several of the images, I have no doubt the book will be a hit with my little geeks,too. Well, at least with my 4 and 7-year-old. My 2-year-old is still working out what tickles his funny bone. One day, he’ll be laughing at a ball bouncing and the next day he’ll avoid the ball altogether. When I presented the book to my little geeks as the story we were going to read before bedtime, my 4-year-old was excited but my 7-year-old said, “An alphabet book, Dad? I know my alphabet. Can we read about sharks instead?” I proposed a compromise that would allow me to read my book and read my oldest little geek’s choice of bedtime literature, too. This seemed to please everyone and we all sat down on the couch to read our books. As it turns out, sharks are less popular than a book that makes you laugh. Who knew? I ended up reading Pandas Paint in Pajamas three times our first evening while the shark book sat in the corner, ignored. As expected, my little geeks laughed at the images and the funny sentences. I laughed, too, which caused them to laugh harder and then me and so on. This was especially true when we read all about the barracudas who liked to break dance in bikinis. Reading time at our house is sharing time. The little geeks jump on the parent geek’s laps, get snuggly under blankets and curl up next to each other as we read the story. The little geeks get entertained and learn new words while the parents get some excellent quality time. The experience is made all the better when the book is genuinely entertaining for all involved. Pandas Paint in Pajamas helped make our quality time all the more enjoyable by making us laugh together. My oldest little geek, age 7, can now read and his reading skills improve every day. If mom and dad are not around, my 7-year-old is sought after by his two younger brothers to read books to them. He doesn’t always comply with their request (which leads to tears and whining), but when he does, my wife and I can’t help ourselves and take candid shots of the event. I’m beginning to think we should set up a blind in the living room to make it easier to capture the moment. The other day, I was in the kitchen looking through our pantry for something to nosh when I heard laughter coming from the living room. With pickle in hand, I peeked around the corner. As fast as I could, I gulped down the pickle and grabbed my camera to take the following shot. Both my oldest boys were laughing while my oldest read and re-read some of the more humorous sentences found in the book. Parent Geeks, this is a wonderful early reader and alphabet introduction book for you to read and for your little geeks to read, too. 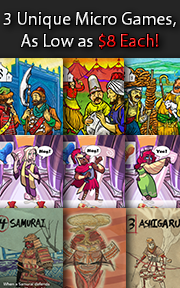 The images are colorful and entertaining. The book provides an opportunity for you to introduce new words and their meaning to your listeners. You can also use the books to teach colors and to point out funny things in the images which will help your little geeks focus in on the story and pay attention to the details. Child Geeks, get ready to learn the alphabet laughing the entire way! Fish in swimsuits? Cats in capes? Hippos in high heels? They are all here in this book and more! 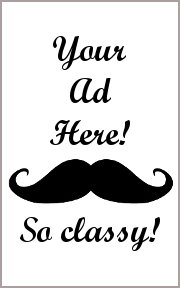 Every image is a delight to look at and the you’ll be excited to see what is on the next page! Somewhere along the way you’ll learn new words, too, and helpful ways to remember what the word is and what it means. For example, just try to forget about rapping rhinos. IMPOSSIBLE! As a parent and a lover of literature, I am most pleased with this children’s book. It does what it set out to do, creatively. Not only does it teach the alphabet, but gives the reader fun little sentences to associate with each letter , and then when most books would simply move on, takes the time to teach the reader and the listener what each word in the sentence means! This provides many teaching moments and a neat way to improve your little geek’s vocabulary. 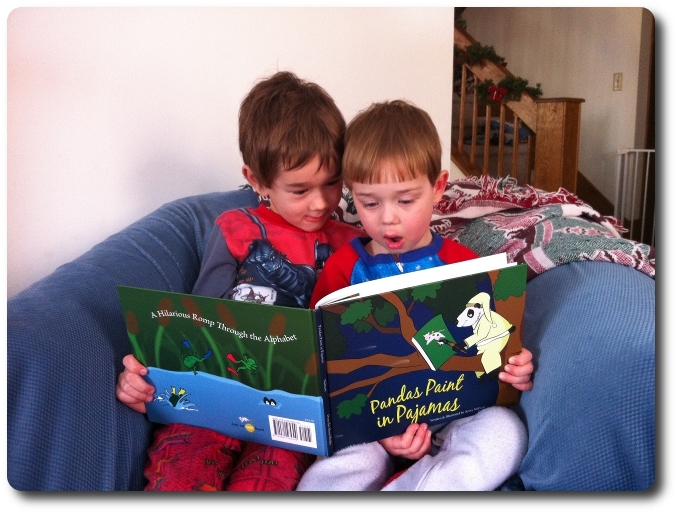 If you are looking for a children’s book that will not only educate but entertain, Pandas Paint in Pajamas is a book you should look for. 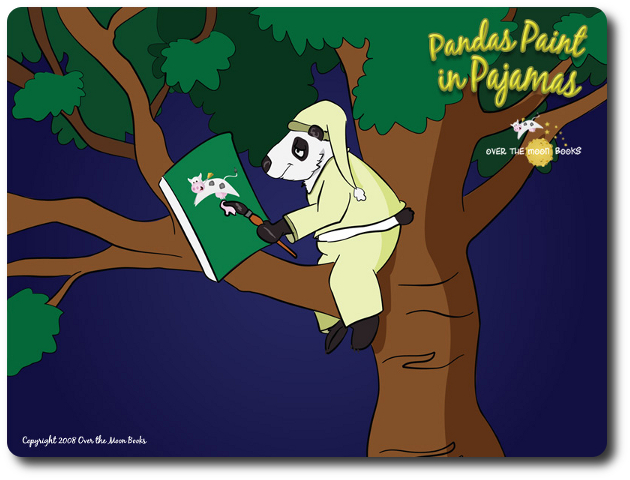 To learn more about Pandas Paint in Pajamas, about the author, additional book titles, and download a free coloring book, visit the publisher’s web site, Over the Moon Books. Tagged Literature. Bookmark the permalink.